A Boeing 737 MAX 7 makes its first flight from Renton Municipal Airport, on March 16 in Renton, Wash. Many of the MAX models will not be targeted by Chinese tariffs. At first glance, China seems to be taking direct aim at Boeing and its workhorse of the commercial aviation industry, the 737, with its announcement that it will impose 25 percent tariffs on commercial airplanes with an "empty weight" of between 15,000 and 45,000 kilograms. But the impact of the proposed tariffs on Boeing will likely come down to how "empty weight" is defined and measured. "China is not targeting the bigger aircraft that Boeing offers," such as the 787, says Dhierin Bechai, an aerospace industry analyst for Seeking Alpha, an information platform for investors. 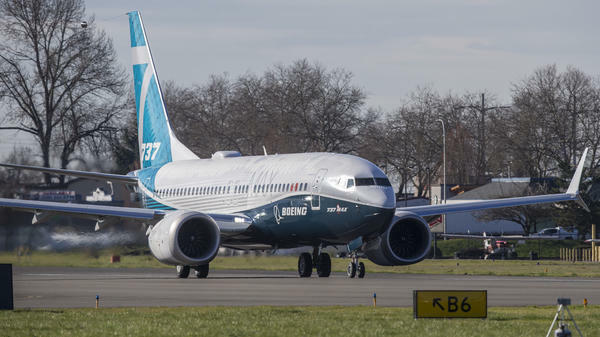 "They are only targeting single-aisle airplanes," the family of 737s. China is Boeing's biggest export market, and single aisle commercial jets, like the 737, are what is most in demand in that market. Bechai notes that while "that is probably Boeing's most profitable business," most of the planes targeted by tariffs appear to be older versions of the 737 that are being phased out of production. Many of the newer MAX models of the 737 are above the aircraft weight class that is targeted by the tariffs. And he says that's what Chinese airlines have been ordering. He estimates that only 17 older versions of the 737 out of 165 aircraft ordered by the Chinese may be affected by the steep tariffs. "The way I see it," he says, "is that they are just trying to make a statement but they are not directly targeting Boeing's core business." Other analysts agree the aircraft tariff is more about sending a message to the Trump administration than it is about hurting Boeing's bottom line. And the reason for that is simple: "China needs those airplanes," says Michael Boyd, president of the Boyd Group, an aviation industry research and consulting firm. "If they cut those airplanes off, it's their economy that's going to get hurt." China needs those Boeing planes to meet rapidly growing air travel demand. Over the next 20 years, the country's airlines are expected to order more than 7,000 commercial jetliners at a cost of more than $1 trillion, according to Boeing's forecast last year. Boeing is in line for about half of that business, Boyd says, because China's own airplane manufacturers "don't have anything on the near-term horizon that could replace Boeing." He says European rival Airbus is already cranking out aircraft at near full capacity, so ramping up production to make an additional 800 to 900 airplanes to fill Boeing's void "just isn't in the cards." In addition, many Chinese manufacturers make parts that go into Boeing planes. "Keep in mind, these airplanes they're supposedly putting tariffs on have a lot of Chinese content," Boyd says. "So if they're going to cut them off, they're going to cut off a lot of Chinese business as well." Still, there's a lot at stake for Boeing. Bechai says he estimates that "China is accounting for almost a third of Boeing's commercial aircraft profits, and going forward, they will need over 7,000 aircraft." While he says Airbus will meet some of that demand and could build more planes, "there's still 3 to 4,000 that Boeing could supply, so the importance of China is really big. China is actually a powerhouse for Boeing's business." "It's a big thing for Boeing, there's no question about it," adds Boyd, about the possibility of China imposing these tariffs or tariffs more widely on Boeing aircraft. "But it's also a very, very big thing for China, so I think we're playing a game of economic tariff chicken; who's going to blink first." In a statement, Boeing expressed concern that both the U.S. and Chinese governments "have outlined positions that could do harm to the global aerospace industry," but adds that "neither has yet imposed these drastic measures." The company remains optimistic that a dialogue between the two countries continues.